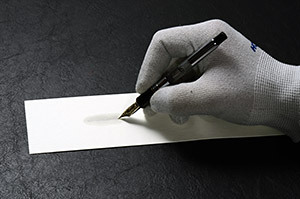 Fountain pen is unlike other writing instrument, there are slight quality differences in one by one. 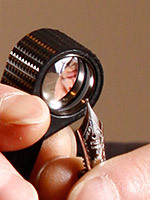 For this reason, in our shop we do the reliable inspecting goods one by one. Even if the product has passed inspection of the manufacturer, we do not sell unless passing our criteria. In addition, not only the check of the functional aspects unlike other stores, it is also checked from the point of view of writing-comfort, I adjust in a range that does not impair the originality if necessary. Left is a photo of checking an ink flow using water and blotting paper. I use water as not to stain your new fountain pen. Fountain pen and other stationery is so delicate, so care must be taken at the packing. I have the experience that I was disappointed by damage of the parcel from abroad. Also, I know the case that the other goods had defacement by ink leakage in the parcel. Even if the insurance is to be applied, it takes time and effort. Those must be avoided naturally. The packing of our shop are care for the following points thoroughly. 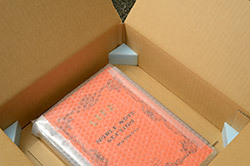 To position products away from the corner of the inside of the parcel as possible. 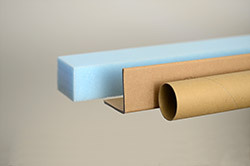 To reinforce the parcel using a lightweight and strong material. 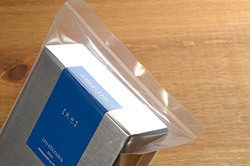 Sealing the package of ink bottle to avoid defacement of the other goods. This is the prevention for just in case of ink leakage accident. These are important things because stationery has weakness to the impact against the corner. We are grateful to your purchase, so must deliver the goods in tip-top quality. Don't you have experience which was delayed arrival of your parcel or stopped at airport? In many cases, these problems are caused by the deficiencies in documents at shop side. There are also cases in which the problem is improper notation of the contents. 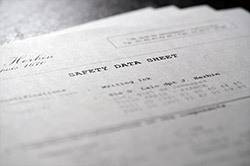 For example, ink is tends to be suspected of flammability because it is liquid, so require to prove that it is indeed safe by attach Material Safety Data Sheet (MSDS) documents. In our shop we prepare with the MSDS for each product and attach ensure as necessary, and make it possible to delivering the goods smoothly. These things, it is rules quite normal in international. However, please note also true that there are shops corresponding inadequate still in Japan. In addition to carefulness as described above, we entrust the final procedure of shipment to the International Shipping Center depending on the case. International Shipping Center is the professional which is familiar with the characteristics of each country logistics, and so we can achieve a very safe and secure shipping. Please enjoy your shopping in comfort at Tokyo Pen Shop Quill.